Guys! We are T minus 2 days until the new year. Twenty-fifteen holy smoooookes. Should we, like, eat some cheese or something? WE SHOULD. And it should be warm. Here’s one last Holiday Mollygram, the last of 2014, anyway, with a recipe for Baked Cheese & Raspberries! 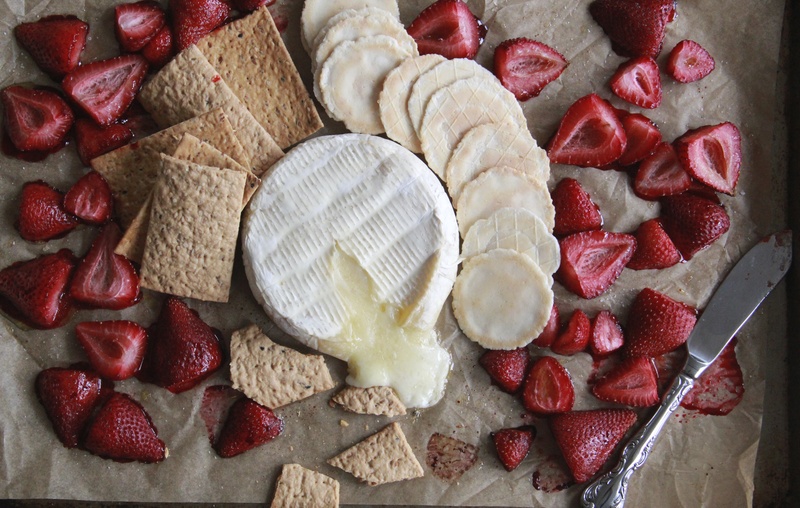 It’s a riff off of a recipe in the appetizer section of my cookbook (in the book it’s Baked Brie & Strawberries, p.9). Whether you use raspberries or strawberries (or pears or blackberries or whatever), it’s a great recipe to ring in the new year. CHEERS, FRIENDS! LOVE TO YOU!! Did you get all that? No? Written recipe is below! This recipe in Sheet Pan Suppers calls for strawberries, but this time I made it with raspberries. It’d also be great with blackberries, blueberries, finely chopped pears, sliced figs, or even a smattering of pomegranate seeds. Preheat the oven to 350 degrees with a rack in the center position. Line a sheet pan with aluminum foil or parchment paper. Place the Brie in the center of the prepared pan. Place the strawberries in a medium-sized bowl, add the olive oil and salt, and toss to coat. Arrange the berries around the cheese on the pan. Bake until the cheese has softened but not melted through the rind and the strawberries have puckered and released some of their juice, about 20 minutes (depending on the cheese it can go faster, so check it after 10). Carefully transfer the cheese and fruit to a serving tray, or serve it right on the pan. Enjoy immediately, while everything is still warm, with plenty of crackers and bread alongside! haaaaa. love this mollygram. also this cheese — delish. SO CUTE!! Stop it right now – I cannot stand how adorable these are. and the raspberry cheese looks delish! Had the one with strawberries and will try this too.